Digital Minimalism: Should You Limit Your Screen Time? For more than a year, a dozen or so Oberlin community and business leaders, including Kendal at Oberlin, have been working on a plan to promote affordable housing as a vehicle to improve the city’s economic viability and quality of life. Phyllis Gorfain, artistic director of an innovative theatre program for incarcerated men, is the winner of a 2019 Governor’s Award for the Arts in Ohio. Oberlin College Professor of English Emerita, Phyllis moved to Kendal at Oberlin in 2017 with her husband, Bruce Richards. 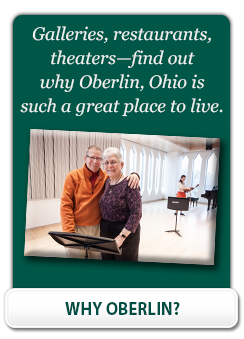 The John Bartram Arboretum Endowment Fund was established by Kendal at Oberlin residents Anne and Jim Helm just about a year ago. The endowment fund of $10,000 is for the benefit of the John Bartram Arboretum of the Kendal at Oberlin life plan community. Opening on December 11th the work of Archived Artist Marihatt, titled Life Reflected, Marihatt at Kendal is on exhibit in the Kendal Gallery.